I didn’t read any of Path’s hype before trying it myself. I wasn’t part of the beta. I don’t owe Dave Morin lunch (he’s the founder of this new thing called Path that’s getting a deep amount of hype tonight. 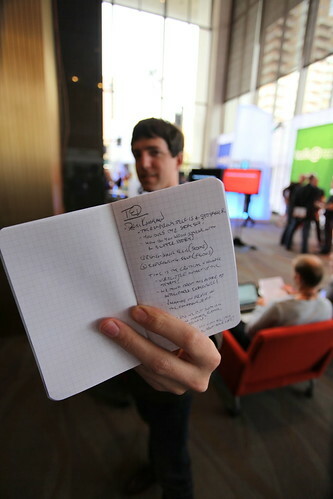 The photo is of him at the TED conference). But I was excited, mostly because Kevin Rose hyped it up a few months ago on Twitter. Whew, guess some PR firm was busy! (That amount of reporting doesn’t happen on a startup by accident). I find software with limitations interesting. Twitter was interesting because it was a blog tool, but one that forced you to keep to 140 characters. I remember having lots of fun trying to see how much information I could pack into a Tweet. Now I have to pick 50 people. Screw Dunbar’s number that says that a human can have between 100 and 230 friends. No, Dave Morin decided we can have no more than 50. Anyway, this is an interesting “walkie talkie” of the modern age. I can use it with my son, for instance, and let him see a photo of something I’m doing and he can send one back. I see if he’s seen the photo. We can see where the photo was taken. But there isn’t any text we can write back and forth yet. Which gets me to the point. This thing will piss social mavens off. See, it’s hard to figure out who is on the system. Instagram is MUCH better done in this regard (you add your Facebook friends on Instagram. On Path you have to add people’s email addresses. Email? Really? OK. The problem is my closest friends and family, like my brother Alex, don’t have an iPhone. So can’t use Path with them). My wife? It’s hard enough to get her to try any new iPhone app, much less one that only lets her share photos with a close group of friends. She says that’s what she uses Facebook for. In fact, Facebook Groups do pretty much what Path does, except without the cool iPhone app. Hmm. Anyway, this is an app that has me saying “hmmm.” If it weren’t backed by a bunch of famous Silicon Valley VCs and Dave Morin, former head of Facebook’s platform, I wouldn’t have paid any attention to it. What Meebo announced tonight is far more significant and interesting, actually. Yes, this whole post will get me kicked out of the Silicon Valley hipster mobile app testing club, but so be it. Path will piss off a lot of people. Ashton Kutcher likes it, though, he wrote that in the Techcrunch post about Path. Me? This will get forgotten pretty quickly due to Facebook’s announcements in the morning. Oh, and if you don’t like Path, please “Tip @techmeme.” Thanks. It’s one way to fight the hype. Or, better yet, just get Instagram and use Facebook’s groups with your close friends and family. I bet they are already on Facebook, right? UPDATE: there’s another MAJOR problem with @path: if you drop someone off of your Path list, they can tell. Zach Ware proves this. Now think of the social problems that will happen if you are on my list for a while, and then get dropped off. Say a family member gets dropped for someone else. “What do you MEAN I’m not your best friend anymore?” That’s really nasty for a system that depends so closely on only being used by friends and family. I hope Path doesn’t go the… way of MySpace, but Pownce was a diamond in the rough for a good year. I miss it. I don’t even know what this Path thing is….but if it’s iPhone only, count me out…. I gave up on the iPhone when AT&T never got around to fixing their network. Also the same reason I hate hearing about Instagram. They don’t support anyone other than iOS, despite Android having a very large install base. I’m sure Instagram will show up on Android eventually. Every developer I know starts on iPhone, cause that’s where the best audiences are, then moves elsewhere. Yeah… I know. But unless AT&T shapes up or the iPhone goes somewhere else (I’ll believe the Verizon iPhone when I see Steve on stage announcing it) I’m done with the iPhone. The AT&T network here is so terrible, I couldn’t even get an EDGE connection most of the time. forget path, world is not for iPhones only… where is the Android app? …OK, but seriously. You have very correct points about adoption among the close friends and family- a network can be constructed right, but still fail completely if it doesn’t get the people you care about involved. Time will tell on whether or not people’s “intimate networks” will really adopt or not. The thing is, if my kid does something really cute, I want everyone on Facebook to see it. Not just 50 people. But I suppose there’s lots of people out there who will want to show photos to only a very small group of friends. I’m sure Path will be successful, I just don’t get it. Instagram is a lot more fun and more useful. i was about to sign up but it required me to enter my phone number. I read through the privacy agreement but i didn’t see anything as to why they need my phone number so i decided not to. I don’t think that was really Ashton Kutcher posting. “A private social network built with rich powerful people in mind who need privacy is a great idea.” is a pretty douche-y thing to say. You really said almost all the things I had been thinking about after trying the app. 1. No text really bothered me! 2. My families phones are not all smart phones and they don’t share that often. But everyone does infact have a facebook. 3. The explore tab not sure that works so great with just 50 ppl. 4. Why can’t you sign up on the site? You have to download the app to sign up? All that hype and press I thought Path was going to be some out of this world thing and it kinda seems like something that has been done how many times over? Isn’t rally Up app the same thing? I don’t know if I am going to use this NOW…. I might wait it out a bit and see what happens or just let it collect dust in the back pages of my iphone and then eventually delete it. and my thesis that “being there in silicon valley is enough to succeed even if you are mentally retarded” finds confirmation. anywho assumption that this thing allows for privacy in small closed circle, think about it: where your photos will stand out less: in private circle on huge facebook or on “private” circle in allegedly private path? good work Robert with not falling for the hype! i have not use the app yet so i cant say that i hate it yet. It seems that people who are separated by long distances (military families and celebrities, for instance) might start using this for sharing *intimate* pictures that they can’t safely share on other networks. Isn’t it true, though, that all the engineers (and VC’s who have access to the back end of this site can see everything posted? What would happen if FB bought this company? Would all the rules change? This all seems very scary to me~ Also, if parents start sharing all the cute pictures of their kids, etc, wouldn’t it also be true that, if sold to FB, all these kids who are the kids of celebs, etc, might be put at further risk of kidnapping, stalking, etc due to their famous moms and dads? It doesn’t seem to me that any site on the web is really *closed and private* -esp. one funded by VC’s who are looking to get a fast ROI on their investment. If that were true, why wouldn’t they use FaceTime? That’s far better way, and far more intimate way to share stuff like that. You actually can sign up on the site – On the top right it says “No phone? Sign up” where it lets you sign up, fill in your bio, choose your custom url, and add a profile pic. Robert, You and your family dont make the billions using the internet. I also dont make the internet. But your views are totally different from mine. Genreal users dont even know whether the stuff they are posting on Facebook is private or public. I find this to be a very good idea. Just share with the people who matter. And really can anyone have 5000 “FRIENDS” . No effing way. I love Instagram, I don’t feel the need for a 50 person photo network which is Mobile only. Some of my friends made the jump too instagram and the rest see my photos when instagram tweets/tumblr’s them. Don’t think this is a huge need, if it’s photos only especially. Maybe if Path came earlier it would be a bit more interesting but I don’t see myself using this for a long time. I am with Andrew on this one. I don’t see myself using this one for a long time or at all. I have a close family network of more than 50 people all with different phones apps and gadgets. They all use facebook and most instagram. I justI don’t think the transition from facebook/instagram would take very quickly. But really, why would we want to make the transition in the first place? Just isn’t enough innovation to really deem necessary to change. I really like Path. The app is so so but the philosophy behind it is AWESOME. That said, I completely get what your saying about this whole Instagram thing. There are only so many new apps I can use. I feel like something better with more hype keeps coming along and I feel pressured to use it. I love Instagram but what about Path? Like I said, Path seems cool. I’m just wondering how I would fit it into my life. In theory, its clear: Path is for REAL friends. But REAL friends aren’t necessarily iPhone users, let alone early adopters of apps like these. Well, between not having an iPhone and not having a Facebook (yes, I don’t have one. By choice. And my life hasn’t ended) this wouldn’t even begin to serve a role for me. After reading over everything, I just don’t see where this fulfills a need that isn’t already being served by numerous other platforms out there. You don’t have Facebook? You’re my hero! That’s correct. Deleted (not just ‘suspended’ it) back in April. Wow. Just tried this out and what can I say? Nailed it. Instagram solves so many of these hurdles without the limitations. I can use the app and share with those unwilling to go as far as an app download but are already connected via social graphs like Facebook. Don’t get me wrong, I like the idea of private services to communicate with a small private collection of friends. I’m a big fan of Rally Up which aims to do just that with location check-ins. But limiting to 50 on a private service is just absurd. I’ll continue to watch closely, but the use case for this app escapes me so far. Agree with you. One startup that brings nothing new. wake me up when mini-Path launches. Funny thing is, I recently started building a kind of API to do these ‘hispter’ camera effects on uploaded photos from phones and desktops. You mean like when you and everyone else hyped up Flipbook for the iPad? Seriously, I never even heard of it until I saw like 10 articles from EVERYONE on the same day. And yes, including you. Just think it’s a bit funny you’re calling attention to Path of doing the PR hype thing when you yourself were part of the Flipbook thing. Um, sorry, only two media outlets got a preview of Flipboard and they didn’t have a PR firm. Oh come on, Flipboard hype was EVERYWHERE when it came out. It may only have been you and another outlet that got a preview, but the day it hit everyone was talking about it. Much more than what Path is getting now. But I’ll take your word for them not having a PR firm hyping it. And in retrospect, they didn’t need one with you and…well, everyone…hyping it. Flipboard is actually pretty useful. NIce, sounds like a plan to me dude. WOw. I’m not sure why it is so hard to understand that some people (particularly those who have no need or desire to perpetually self-promote online) would like a system that allows them to share something with their REAL friends. It shouldn’t be difficult to conceive of a photo that would funny and beloved by your close friends and family but seen as irresponsible or childish by co-workers or others. Sure you COULD do a Facebook group or whatever. You could also set up your own website with user accounts and password protected access, but if you aren’t a techie, those things are beyond what is “worth it”. Facebook and the like allow you to promote yourself around the world, but that isn’t where the 500 million users comes from. Numbers like that come from Grandmothers signing up because they are missing out on pics of grandkids, not because they give a d#mn about Ashton Kutcher or anyone else. I for one hope it succeeds long enough to expand past the iPhone or at least inspire others to create a similar system. The really intriguing thing will be that if someone gets this concept just right, then Facebook, and the like, would see a sharp drop in their growth. Well said. There is a real market here. It’s hard for the attention-seeking crowd to understand a good chunk of FB users just want to talk to a couple of their nearest and dearest. I have considered setting up FB groups or purging “friends”, but the effort required isn’t worth the outcome. A simple non-public site sounds delightful. Only things missing in my view is the ability to make comments and take pictures from the camera roll. But they will hopefully figure that out. If this takes off, “Why did you drop me from your 50” is going to become the new “Why does your profile say you’re single”. Great post, Robert! This thing is totally DOA. I don’t know what VCs see in this thing other than blindly trusting the names involved. Basing a product on academic studies of a few Socialists who likely have no real world experience is just bad judgement. If Path is to survive they will need to rethink it’s premise and market. Not for me. Found you and Winer, and added my family. And then what? No serendipity, that’s what. I love it when people I didn’t expect comment or answer my posts. Yet Another Social Networking InstaApp, just with a privater-network irrational-exuberance PR pitch, good luck getting the non-geeks who really matter in your circles to actually install and use the app. Facebook for all it’s serious bugs, architectural problems, and poor UI 1996-era insanity, has one thing going for it, everyone is there. If they had allowed 5,000 friends, would just be another endless grain of sand, but limit it to 50, and fire up the spin doctors to excite the ‘rewrite-press-releases’ dull tech press (and their over-expensive wine-bar hipster friends) into full night-long trance raving. I swear all the VC monies for iPhone InstaApps is beyond all reason, venture is subprime totally. First thing I’ve agreed with you on in years. I think you’re doomed. They aren’t looking for the Scobleizer, they want Joe@aol.com.